Let’s add some yards to your drives with a sneaky weird trick. And the advice I’m about to give you will increase the distance of your drives permanently. I know there’s nothing worse than trying a tip, a new driver, or having a lesson and hitting the ball further, only for that new distance to disappear a few days/weeks later. 1st. You need to go to your local driving range and take a notebook and your golf clubs, along with a calculator (your cell phone probably has one). You need your driver when you’re doing this so make sure you take that. 2nd. Warm up by hitting about 20 shots or so. Then get out your driver and proceed to hit 20 shots as well as you can. After each shot record how far the ball went. 3rd. Once you’ve hit all 20 shots and recorded all of the distances, then I want you to find out the average distance you hit your driver. 4th. Get another ball ready, but this time I want you to stand behind your ball and see yourself in your mind’s eye swinging and hitting the ball 50 to 100 yards further than your average. 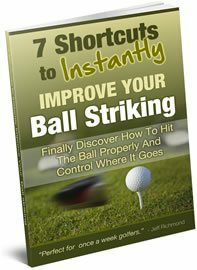 See the ball coming off your clubface and the ball flying through the air and flying and landing way beyond your average driving distance. It’s very important when doing this that you see clearly in your mind, the ball flying 50 to 100 yards further than your average. Spend about 20 to 30 seconds before each shot visualizing this. When visualizing like this you can do so with your eyes open or closed. Aaron Baddeley does this with his eyes closed before each shot, but other great players like Jack Nicklaus do this type of visualization with their eyes open. It’s also very important when doing this and setting up to the ball that you look at the new target, which is 100 yards or so further up than your average drive. Do not look at where a normal drive goes for you. 5th. After you’ve hit your next 20 drives then record the average distance you’re now hitting your driver. 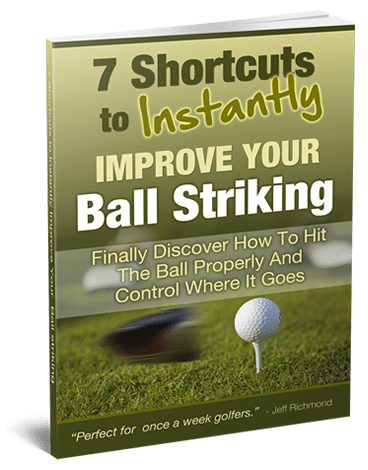 When you do this exercise you’ll feel your swing is more powerful and the ball will fly further, without you consciously trying to make it happen. This is just a glimpse at what is possible for you, IF you use your mind the correct way.